There is a woman who has a profound effect on my life and I doubt she’ll ever know it. In fact, I owe this woman an apology. Back when my husband (then boyfriend or maybe fiance) and I were living in Toronto and childless (10 years ago or so) we used to shop at our local Walmart in the Stockyards. We would often be there shopping at the same time as a woman with her young children. This is my apology to her. I want to apologize to you for not understanding. I want to apologize for criticizing your parenting, for making comments about your child that I had no business making at the time. When we would see you and your children at the store, your daughter, who was not more than 7 or 8, would wander away from you, making high pitched noises. I would watch as she would yell and scream and at times and it seemed you had no control of her. She would pull things off the shelf, or stand in the middle of the aisle screaming if you took something away from her. I would roll my eyes and my husband and I would make remarks about how badly behaved she was. How we would not be that kind of parent, oblivious to our child’s rude behaviour that was disrupting the shopping experience of others. We would talk about your lack of parenting skills and tsk tsk you. I am ashamed and appalled to admit to this behaviour. You see, I now understand your daughter was autistic. I understand that what she was doing was simply stimming and communicating in the only way she knew how, in a place that overloaded her senses and caused her great pain. I can empathize now, because I now have a daughter with autism. She is high functioning and doesn’t often melt down or cause a scene in public, but it has happened and I have been at the receiving end of the comments and the looks. When they happen, I am angered by the fact that people are so ignorant, are so unaware and uneducated. Then I humbly remind myself that I WAS one of those people years ago. I wish I had known then what I know now, for I would have gone up to you and given you a smile, a look, some kind of encouragement, or an offer to help, because now I understand. I understand how going shopping is not easy or fun. Autism has changed our lives in more ways than I can count. We can no longer just do something on a whim, everything has to be planned and carefully executed. We have to tell our daughter where we are going, for how long and who will be there. She needs to see pictures of things ahead of time to ease her anxiety. We can’t plan more than a couple of things in a day and our home life is all about schedules, to do lists and timers. We have a sensory-friendly home and need to keep chaos to a minimum; it’s all about structure and routine. Autism has cost us friends. We had a vision of how our life with our daughter would be and autism has changed that. We were social butterflies. Our daughter cannot handle that lifestyle. I can only imagine the vision you had and had your life changed as a result. I now know you were incredibly brave and strong to be able to go out and do your shopping, knowing what most people were likely saying about you and your family or your parenting skills. That takes some kind of courage and I applaud you for that. I now know I am sure you were doing the best you could and being the best parent you could be for your daughter. You have had more of an effect on me than you know, and I think you are partly the reason why I blog and the reason that I spend a lot of my time as an advocate trying to educate and raise awareness. 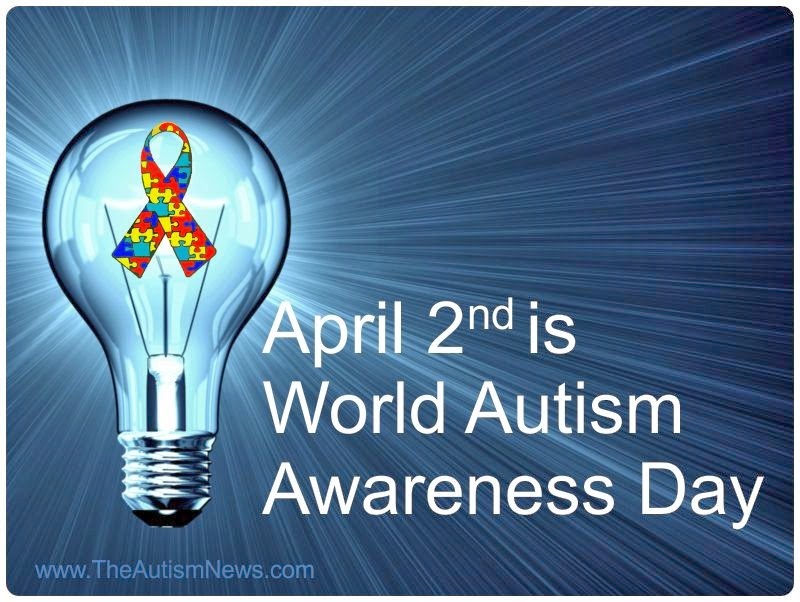 April 2 is World Autism Awareness Day and it is why I have chosen to apologize publicly to you for the ignorant and shameful way I acted. It is my hope that with this letter I can change maybe just one person’s awareness and education of autism and the effect it has on our children and the lives of those around them. To medicate or not to medicate: that is the question. But who has the right answer? For us, the decision to medicate did not come lightly. We had been thinking about the possibility for almost a year before deciding to take the plunge. The mood swings, the anxiety, the self-injurious behaviours, which were becoming more extreme, were simply becoming too much. I could no longer stand back and watch as my Monkey crumpled into a world of self-hate and anxiety. I could no longer stand back and watch as he slapped himself in the face. We had to examine at what point do the risks associated with medication become more manageable than the reality we were living? I have written about the Monkey’s anxiety in numerous posts, anxiety so severe that it takes over even when he is doing the things he loves; anxiety that makes it almost impossible for him to cope with the world around him. After Christmas I, once again, had to sit outside of his bedroom for him to be able to fall asleep. His anxiety would take over and he was unable to get out of that loop. This was our breaking point. We were regressing back to a time when he was 5 and could not fall asleep without planning out every detail of the next few days. None of us could go back to that. We weighed heavily on the side effects of not only the medication, but of chronic stress and anxiety. Stress can destroy the body, weakening the immune system, causing sleep disturbances, weight gain, and damage to the brain. (Click here to read more on that). Being in a constant state of high anxiety may potentially be more harmful than the side effects of current anxiety medications. In the end, the risks of medicating seemed minimal compared to not, especially if it meant allowing the Monkey to have a better quality of life. We hoped that giving him a small dose of something could ease some of the aggression, anxiety, and rigid behaviours. We spoke with our family doctor and our pediatrician who both agreed that medication may be our only option. With this we started on Risperidone. Risperidone does not help with anxiety; rather, it is meant to help with the aggression, meltdowns, self- injurious and repetitive behaviours—and boy did it ever! Within a few weeks his moods were more stable, he was laughing and playing more, meltdowns were almost unheard of aside from those caused by anxiety, but even those were improved. The Monkey’s anxiety seems to affect him a little less now as the anxiety that stemmed from the repetitive/OCD behaviours has almost disappeared. At school this has translated into him being more focused, calmer, less fidgety, and more engaged. 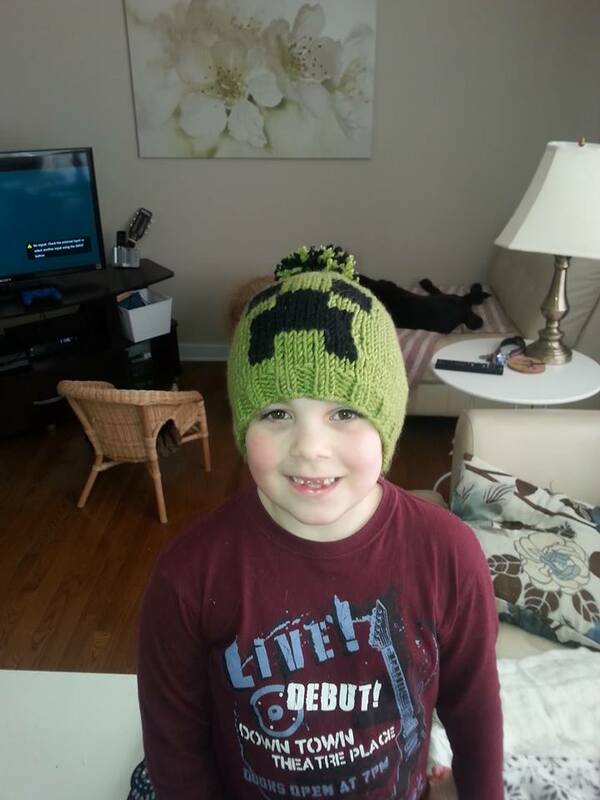 His teachers even said his anxiety at school seems to have almost dropped off the map as they notice less and less ticks. I watched as he skipped and hummed halfway to school the other morning. My jaw almost dropped. Who is this happy little boy before me? Who is this boy who will sit and talk to me now without getting angry or upset? Who is this boy who will answer a direct question? Seeing all these positive changes proves to me that medication was the right choice for him. Medication means that he is actually HAPPY! My Monkey is happy and that is the only thing I need to see to settle any doubts I had regarding our decision. It has been two months since we started a low dose of 0.25 mg of Resperidone and I do not regret it at all. We will likely still need to add an anti-anxiety medication to help with the social anxiety that still keeps him from enjoying, or even trying, anything new, but we have decided to wait and see what grade 1 brings and how he copes with the transition. Medicating your child is a very hard and personal decision, but sometimes it is the only option. As I watch my boy smile more often, I know we are doing what is best for him. Before we reached our tipping point, I probably would have said I would never medicate my child, but Autism has taught me to never say never! As we face our third or maybe fourth snow storm in about 10 days, and second ‘blizzard’ warning anxiety was in high gear in our house. MJ doesn’t like storms of any kind, especially not after Hurricane Arthur crashed her birthday party last summer. Her anxiety takes over and she worries about everything from power outages, to how the animals and trees outside will fair all the way to being concerned about getting into car accidents and fires. So it was no surprise when she came home after school/daycare with the snow already falling that she was on edge. 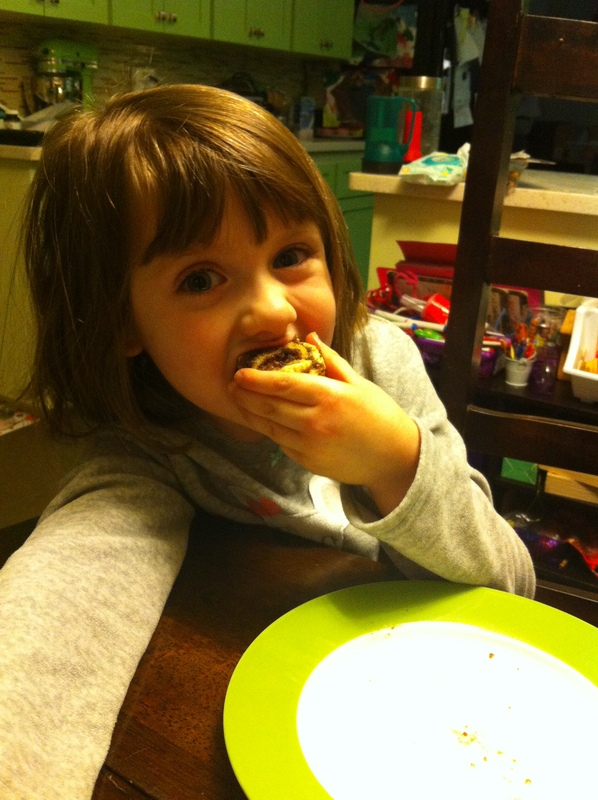 We have also been struggling with MJ’s eating as of late, not at home or at daycare, but at school. She has lost nearly 5 pounds since starting school and trust me when I say she didn’t have 5 pounds to lose. MJ told us that she really is still quite anxious at school and feels the ‘green liquid’ (aka her reflux) pretty much all the time, she just doesn’t tell anyone because she doesn’t want people to know. She went so far as to be proud of the fact that she can ‘hide’ how she’s feeling and pretend like everything is ok, she just doesn’t want to eat as a result of all that pretending. Uh oh… Needless to say we have a doctor’s note and are working with the school on strategies to address this. Today in amongst the concerns over power outages and worrying that mommy was going to die one day, she told me that one of her classmates had a cinnamon bun for snack and it looked so good and that it made her sad. Immediately my hubby reminded me we had an aunt’s awesome cinnamon bun recipe that I’d tried to make MJ friendly previously but had failed at. Since that time, I discovered a dairy-soy free margarine that has made substitutions easier and 95% of the time you honestly can’t tell the difference. I’ve been trying to get her more involved in cooking with me, hoping that if she helps she might be more inclined to eat. It has been going really well for the past few weeks, so well that MJ has decided that she wants to have a cooking show with me one day called ‘Scratch – Cooking for kids with allergies’ and has had me videotaping her as she ‘prepares’ food with me for the week. (For reference, we only started letting her watch MasterChef Junior AFTER she came up with this idea of having a show). 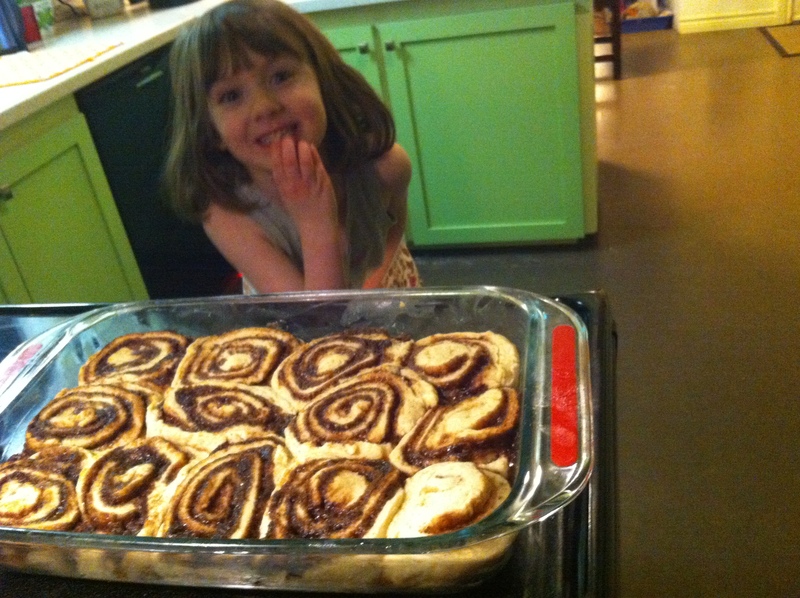 – She couldn’t wait for them to come out of the oven and eat one. We struggle with positive food associations because of her reflux and as I noted above, her diet is pretty limited (although healthy). The only problem? They are so good they might not last that long! Here’s a couple of our videos and of course photos of the finished product! Today my news feed has been filled with horribleness. Not only do Rebecca and I run a blog and Facebook page but we also follow many of the lovely, informative, and heartfelt pages on Facebook which are primarily centered on Autism. It is like being part of a little community. No one knows each other yet we can relate to the hardships and the joys which come along with this journey. Most mornings I happily read through most of the pages I follow. I like, comment and share. Today I saw anger towards a page filled with hatred. A Facebook page was published which attacks the people whom we love the most. A page which shares hatred towards the very community which I so openly praise. 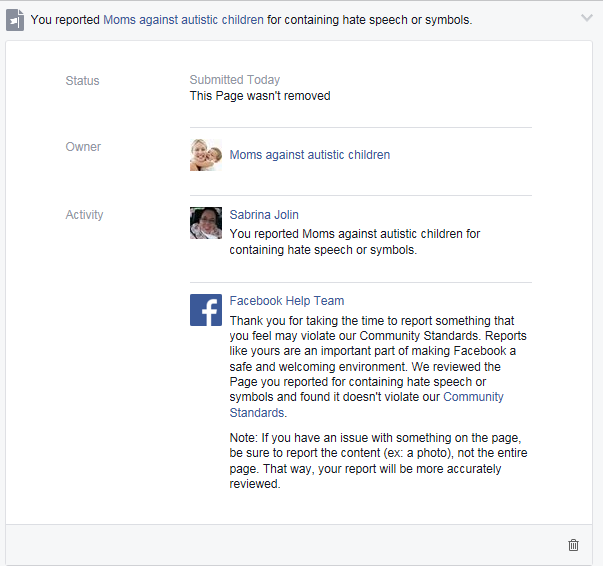 So like other’s who felt like this page disgusted them I reported the page to Facebook thinking Facebook would promptly remove it. I don’t know who has offended me more, the page and the hatred it is spreading or the lack of compassion received from Facebook. How can an entire page filled with hate speech towards those with disabilities and their loved ones not be violating your “Community Standards”? What is the point of allowing us, the people who use Facebook, to report pages that are attacking an entire group of people if you, those who maintain Facebook, will not even take the time to acknowledge that something is wrong? Are your standards so low that you deem this to be acceptable? How do you allow pages like this to continuously pop up? Should there not be a filter that prohibits the publication of certain things to begin with? After numerous reports were filed it did get taken down only for a new page to be created in it’s place! And when pages like the one you see above are reported to you it would be appreciated that you have someone take the time to thoroughly look over the page to it’s entirety. Sending someone a message indicating it is not infringing on any community standards you have decided on is in no way acting in the best interest of your users. You should be ashamed of yourselves for continuously allowing this to happen. There are probably hundreds of pages which are directly attacking minority groups on Facebook. In a small way you are an accomplice to the hate that is being spread. By not thoroughly investigating these pages you would be partially to blame for the impact it has on the people who read them. I am in the end disgusted by the creators of the page, who think that it is funny and entertaining to attack a group of people and also with Facebook in allowing this to happen over and over again.